The 003 Main Street bus, which runs between downtown Vancouver and Marine Drive SkyTrain station, is such an efficient way of moving people that it actually saves society two cents every time a passenger travels one kilometre. 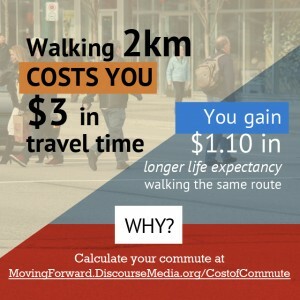 That is just one insight from the Cost of Commute Calculator, an interactive tool we developed that aims to capture the full cost and benefit of driving, taking the bus, cycling and walking in Metro Vancouver, as well as rising costs of auto insurance and the ability to get a quote from My Insurance Guide. Big ticket items like the cost to build road infrastructure or operate buses typically dominate debate over the ongoing transit referendum in Metro Vancouver. In addition to those, this calculator also considers the costs of less obvious impacts like emissions, climate change, accidents, congestion and even noise pollution. Applying this type of analysis − known as “full-cost accounting” − to transportation is commonplace in Europe, but rarely undertaken in North America. With voting in Metro Vancouver’s transit plebiscite underway, Poulos says the calculator enables voters to consider the broader costs to themselves and to society as a whole. How much the proposed 0.5 per cent hike to PST will cost Metro Vancouver residents has been much debated (the Mayors’ Council estimates an average household will pay $125 more annually while the No camp puts that number at $258). However, these figures only account for a sliver of the full impact that the referendum’s outcome will have on individuals’ pocketbooks. “We have a tendency to only look at direct costs, like the PST increase or the cost of gasoline,” explains Poulos. “We don’t always consider the hidden costs and benefits to ourselves and society of our transportation habits when we decide how to vote. But, in reality, we do this mental calculation every day when we decide how to travel. We ask ourselves: Do I have time to wait for the bus? Am I going to get stuck in traffic? 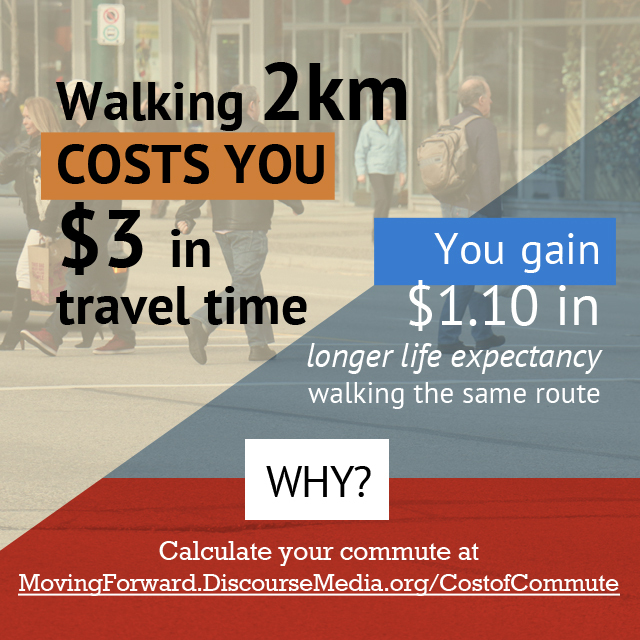 Should I get some exercise by walking?” The calculator puts a dollar figure on factors like the cost of waiting in traffic or the health benefits of walking. While many organizations have produced reports in the lead-up to the referendum on topics such as the potential costs of congestion and impacts of transit on equity, these focus on single elements of the overall impact. The Cost of Commute Calculator is an attempt to capture the bigger picture and equip voters with a calculation personalized to their individual travel patterns. 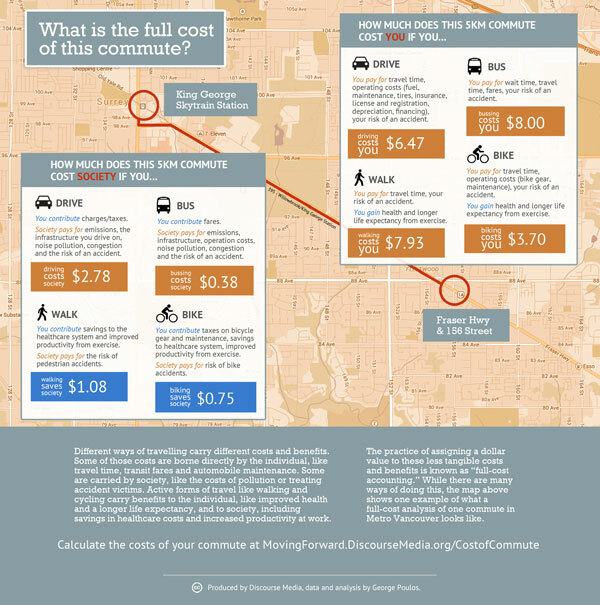 Scroll to the bottom of this article or go here to find the Cost of Commute Calculator. Poulos developed his approach to accounting for the broader costs of travelling in the city of Vancouver as part of research he conducted while a graduate student at the School for Community and Regional Planning at the University of British Columbia. In collaboration with Discourse Media, he expanded his analysis for the entire Metro Vancouver region. One reason full-cost accounting across all forms of transportation is rare in North America is because of debate in planning and policy circles over what costs to include. As a general rule, transportation costs fall into two categories: costs paid directly by the user and costs society bears. For example, the most obvious direct cost to the user of taking the bus is fares. Yet there are other things that factor into our decision about whether or not to take the bus, such as time spent waiting and travelling. Less obvious costs include the user’s risk of being in an accident while travelling on the bus. The costs to society of taking the bus take many forms. The most obvious are those paid by TransLink, direct costs such as purchasing the vehicle and paying the driver’s salary. Others include the impact of the bus’ carbon dioxide emissions, contribution to road congestion and noise pollution, which influences property values and has minor impacts on health. As Poulos noted, we consider our individual costs when we decide how to travel. We might choose to walk to work one day to save money on fuel and get some exercise. If we’re short on time another day, we might choose to drive because the added cost is worth it to us in that moment. But what we rarely consider, in any concrete way, is the impact of our decision on the larger system. This means planners like Poulos ultimately have to make decisions about what to include (and not), in part based on the quality of data available. 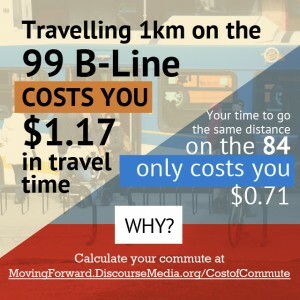 For example, the Cost of Commute Calculator does not include the capital cost of the overhead cables that run the handful of electric trolley buses that operate in downtown Vancouver, the land value of roadways or water pollution from road infrastructure, among other costs. Then there’s the challenge of assigning a dollar value to each impact. In the case of travel time, Poulos relied on a standardized calculation used by the B.C. government to value time in transit that is based on the average regional wage. Other impacts, such as accidents, are more complicated. Poulos reviewed hundreds of ICBC accident case files and Vancouver Police Department fatality records to estimate the number, type and severity of accidents in Vancouver. Then he sought figures from the Centre for Transportation Studies at the Sauder School of Business to account for forgone wages due to premature death. Why look at the broader impacts of transportation? European transportation planners have long used full-cost accounting to help them set levies and taxes that reflect both direct and indirect societal impacts of different forms of transportation. This is known as “internalizing” externalities; the idea is that if individuals directly pay an amount that accounts for the hidden costs to society of their transportation choice, they’ll consider them when choosing how to travel. Such a policy tool is useful when setting the price of a bridge or road toll, for instance. (In North America tolls typically only cover infrastructure costs, not all externalities.) It’s the same concept that the BC government used when creating its carbon tax. The aim is to reduce emissions by putting a price on each tonne of GHG emitted, which will, in turn, “elicit a powerful market response across the entire economy,” according to an explainer on the B.C. government’s website. Canada takes some externalities into account, but not in a consistent or comprehensive manner. But that’s not for lack of trying. Transport Canada grappled with the challenge for five years, from 2003 to 2008, through an intensive study known as the Full Cost Investigation Project. Despite making some steps forward, its efforts eventually faltered. “Resolving methodological issues to the satisfaction of all parties would not be possible,” the final report stated. Even in Europe, deciding what to include, and how to account for it, is still hotly debated. For example, the European Commission doesn’t account for how a mode of transportation, such as a major road or pedestrian infrastructure, impacts the quality of public space, an externality that Transport London assigns a dollar value. When Copenhagen began analysing the full economic impact of cycling infrastructure in 2009, its calculation went so far as to include “branding/tourism.” (Every 10 kilometres cycled corresponds with about four cents in added value to the city’s brand, Copenhagen estimates). Deciding who should pay for costs is also a challenge. How much of the expense of building roads should be assigned to passenger vehicles versus busses versus bicycles? How much of the cost of collisions between vehicles and pedestrians should be attributed to each party? There are also inherent limitations to the tool. For example, when you calculate a bus commute, it doesn’t include the benefits you would naturally receive from walking to the bus stop. That you would need to calculate separately. 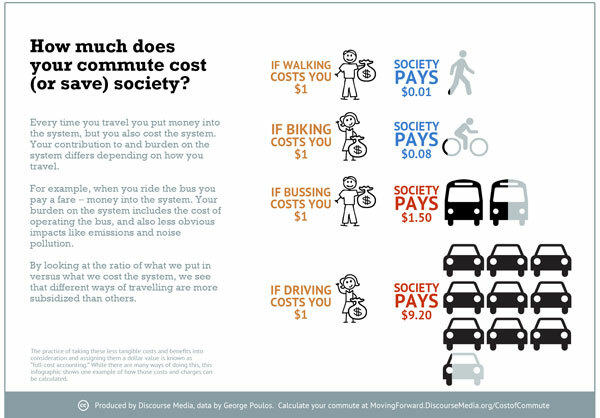 In the absence of mechanisms that force us to directly pay for the broader impacts of how we travel, we tend to underestimate the total cost to both ourselves and to society of different modes of transportation. This influences our daily decisions about how to commute − but also our views on whether or not to support proposed transportation investments on the referendum ballot. For example, the price tag of replacing the Pattulo Bridge or building rapid transit in Surrey is frequently mentioned when discussing the referendum. But we don’t consider the added cost of waiting longer when busses are full. We don’t account for the increased life expectancy we gain from cycling, even though our decision to commute by bike means actual savings to the healthcare system. 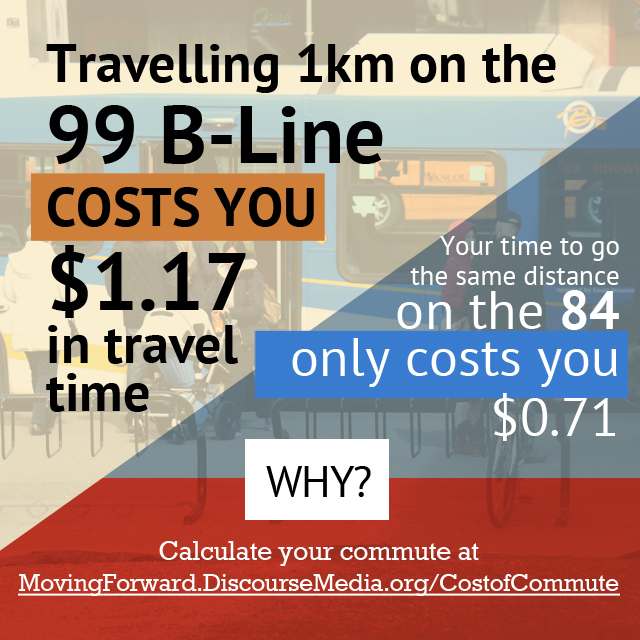 The Cost of Commute Calculator even assigns a value to the discomfort of riding a packed bus. After all, commuting on crowded public transit feels longer than the same time spent walking on a pleasant day. One way to understand this contrast is by considering the ratio of money contributed to the system by users to the amount each mode of transportation costs the system. For every dollar drivers pay into the system through direct taxes and levies in Metro Vancouver, for example, society pays $9.20 for infrastructure, road maintenance, increased healthcare costs due to air pollution and other impacts. In contrast, for every dollar bus riders contribute, taxpayers put in $1.50 collectively. While cyclists and pedestrians don’t contribute much financially upfront (if anything at all), their travel habits result in health care savings and improved workplace productivity thanks to the additional exercise they are getting. So their commutes, on average, contribute a net benefit to society. The dominant narrative is that investing in public transit is important because it’s good for the environment and for low-income people. But when the hidden costs and benefits are also weighed, the argument over how we should invest in our transportation system is revealed to be much more complex. NOTE: This article was originally published as part of Moving Forward, an independent data journalism project by Discourse Media, an organization dedicated to innovating new models for producing collaborative journalism in the public interest. Moving Forward aims to dive deeper into data about Metro Vancouver’s transportation system in order to foster an evidence-based, accessible dialogue with all residents of the region throughout the period of the Metro Vancouver Transit and Transportation Referendum. Moving Forward is supported through crowd-funding. If you find this content valuable, consider supporting the project on Indiegogo. Moving Forward invites media of all kinds to republish their work. See the original article and download raw data, copy infographics or grab an embed code for interactives here. Full disclosure: Reporter Christine McLaren’s partner is an employee of TransLink. This calculator app refreshes every hour. If it appears grey on your screen, just refresh your browser and it will appear normally again.